As we age the visible signs of sun damage, lifestyle choices and the natural aging process will appear in our complexion. 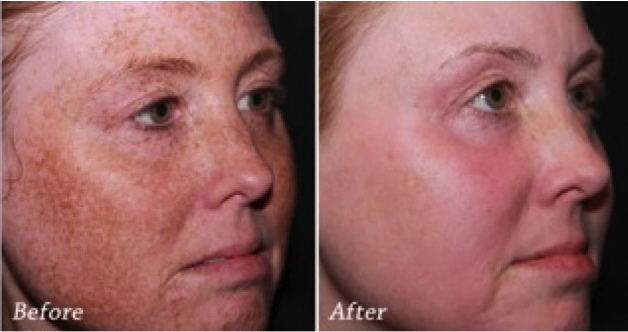 Photo Facial Rejuvenation – IPL – is the only non-invasive procedure that treats pigmentations, broken capillaries, chronic redness, red scars and rosacea safely and consistently. With the use of AFT Pulsed Light Technology, dramatic improvements can be accomplished for these skin problems with minimal discomfort. Broken Capillaries and chronic redness. Hyper Pigmentations and dark spots, blotchy skin color, irregular tone. Also known as IPL, Photo Facial Rejuvenation is an Intense Pulsed Light treatment that can be delivered in a single session or for some, in multiple sessions. The light is gently pulsed over the skin and is absorbed by either the colour of the lesions, or the colour in the unwanted blood vessels and broken capillaries. Lesions such as Age Spots, Brown Spots and Hyper pigmentations will darken immediately and then will fade within the days to come. Veins and Capillaries often show an immediate response, but may need a few days to resolve. An exciting feature about Photo Facial Rejuvenation is that there is little or no downtime. Prior to treatments it is important to avoid direst sun exposure, self-tanning creams and the use of tanning beds. Freshly tanned skin increases the risk of complications and should be avoided – your technician will discuss this with you! To ensure your treatments are both safe and effective, we recommend the use of sunscreen. Multiple factors contribute to rosacea, and the two most common forms present with either slight facial redness OR persistent redness with bumps and pimples. In its more challenging form, Phymatous Rosacea will be characterized by an overgrowth of tissues and irregular surface of the skin, typically around the nose. This subtype is characterized by flushing and may include visible blood vessels that have burst as a result of frequent flushing. This can be accompanied by stinging skin, burning skin and swelling. Arease of redness are typically prominent on the forehead, red cheeks, nose and chin. Characterized by persistent facial redness, this category is accompanied by acne-like bumps and pimples. It is often seen after or at the same time as subtype 1 and commonly mistaken with acne. Papules are small, raised and discoloured bubbles of skin, or solid without visible fluid. Acne-Rosacea is distinguished from acne because it does not include blackheads as seen with acne, nor is it associated with the sebaceaous glands. . Furthermore, Acne-Rosacea presents itself as an adult affliction and restricted to nose, cheeks, chin and forehead. Rosacea is most common among Caucasians of Celtic or Northern European decent. It affects three times as many women as men and presents itself between the ages of 25 – 35 or during menopause. Over 17 million people in North American are estimated to have rosacea. However, this skin disease is significantly under diagnosed as many sufferers attribute symptoms of redness bumps and pain to lifestyle, acne or general skin sensitivity. Most patients have hyper-irritability of the skin with many creams/ointments/lotions causing a burning or stinging of skin. This cosmetic intolerance can hinder treatment, as even prescription creams are compounded with bases that produce unpleasant sensations. There is increasing evidence of a genetic component of rosacea. Although the genese have not been conclusively discovered, a majority of people have seen it in their immediate family. Demodex mites are microscopic inhabitants of normal skin and are found in much greater numbers in rosacea patients. Furthermore, people with subtype 2 rosacea are found to have a greater immune system response to bacterium found in Demodex, Bacillus oleronius. Intestinal bacteria may also play a role in causing rosacea as small intestinal bacterial overgrowth is more prevalent in people with rosacea that those who don’t have it. It is for this reason that rosacea is sometimes treated orally with prescription or herbal and homeopathic remedies. By keeping a daily diary, most sufferers are able to identify the source of the rosacea problem. If you would like guidance on how to manage your RED skin, contact us for your FREE Consultation.